I like to mix fruits and vegetables when making juices. Some people disagree that they can mix, but it’s really your personal preference. I love this one, good as an anti-inflammatory drink. This combo is high in antioxidants and vitamin C which are natural pain killers. Pineapple juice contains Bromelain, a good anti-inflammatory food, but drink only freshly extracted juice. Canned or frozen pineapple juices have lost this pain-reducing enzymes. 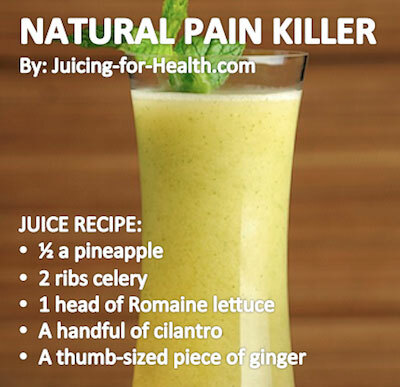 Romaine lettuce, cilantro and ginger all have their individual anti-inflammatory properties, making this juice combo very effective to greatly reduce inflammation and pain. Note: Pineapple may clog up your juicer when juicing as it is very fibrous. Remove skin, cut into smaller pieces for juicing. I am looking forward to trying this. I have fibromalgia – crippling arthritis- PTS – heart prolapse – and an non-reversiable ileostomy. I guess I am lucky with God’s help. Thank you and God Bless You.